“We are pleased to announce we have joined with Clear Scraps for a Blog promo for the entire week. Our DT members will be showcasing how to use our products using some of the fabulous Clear Scraps products have to offer. Be sure to check in every day for a new amazing creation by our talented DT Members”. 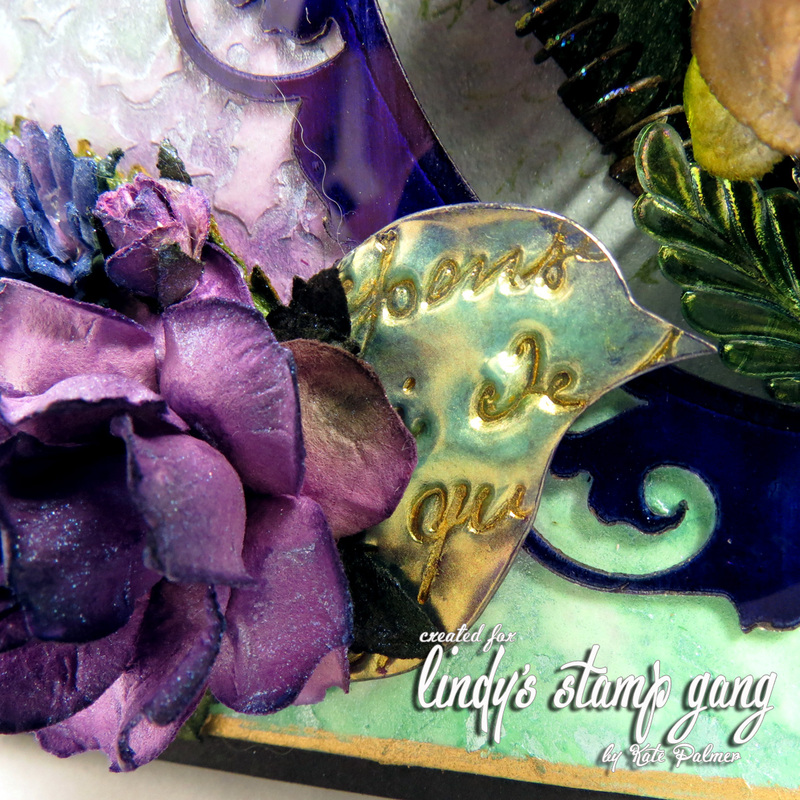 Hi all – Kate here and today its my turn to share a project created using the following gorgeous products from Clear Scraps and Lindy’s Stamp Gang. 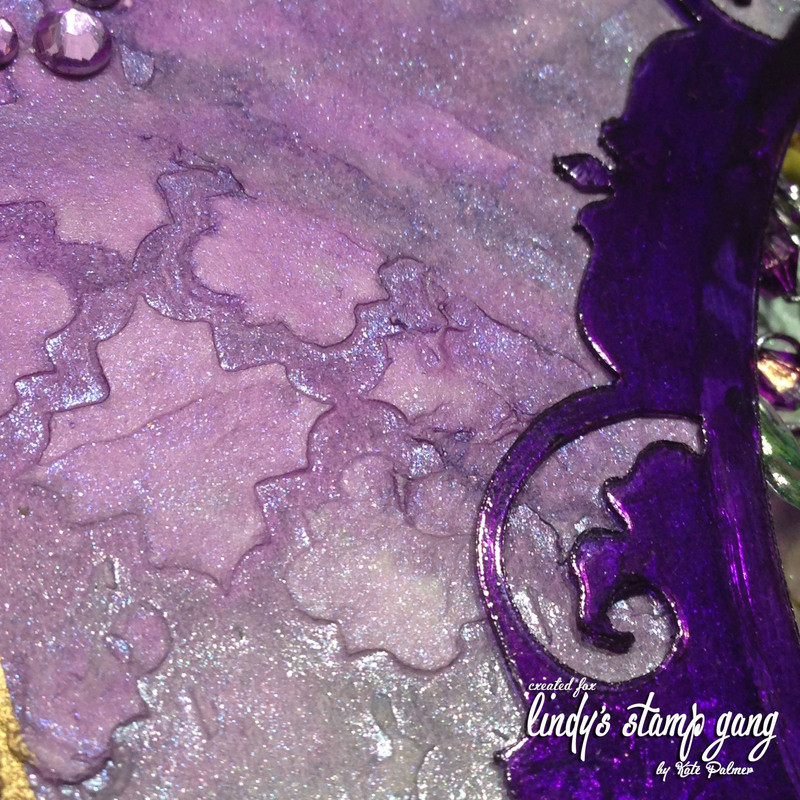 I began by using texture paste through the Quaterfoil stencil, to add the design to a piece of watercolor card. Once dry I added the Starburst sprays (Tea Pot Purple and Mad Hatter Mint) and allowed these to mix a little. While waiting for the background to dry I used the same 2 sprays to add colour to a variety of paper flowers. 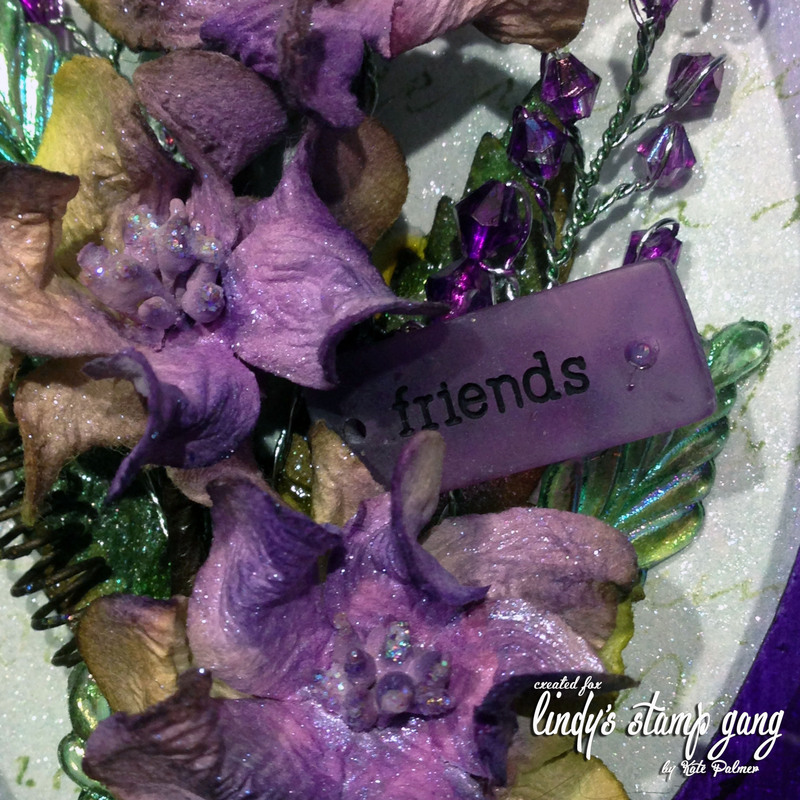 I added embossing powder over the Bird embellishments CAREFULLY heated and then while the embossing powder was still warm I stamped into it to create the text design. 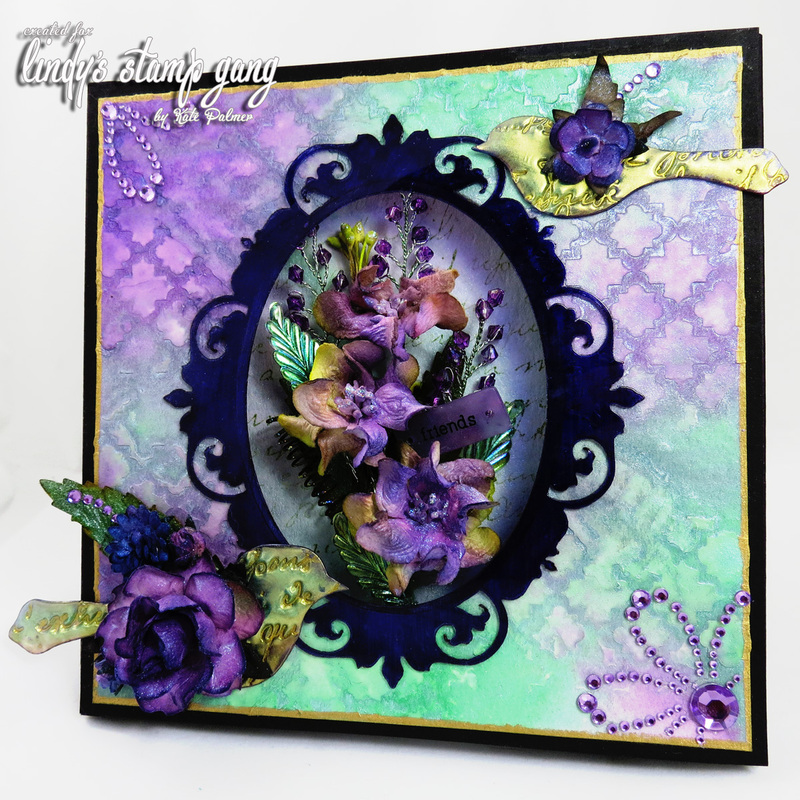 I coloured the Clear Scraps: Small Oval Fancy Frame, so that it matched my project, and glued this over the window I had created in the centre of the card. Into this window I glued down a flower arrangement. 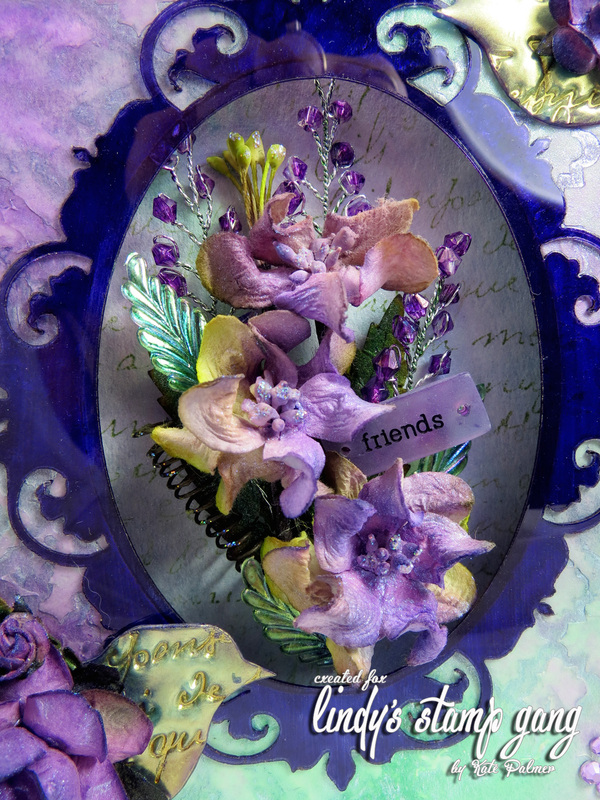 Finally, I glued the birds onto the card and used a few extra flowers to embellish. Kate what a stunning creation. I absolutely love this colour combination. The stencilling and the embossed birds are magnificent.. Thanks Jan – I only wish my photography was better so you could see it better. Thanks Debbie – much appreciated! Absolutely stunning. Love these two colors together. And the embossing and stamping technique, so much fun.